What is most striking about the uncovering of the neo-Nazi cell in Germany is the lack of transparency and the unwillingness or inability by the authorities involved to provide information and accountability. The number of mistakes and misjudgments and the extent of negligence in the criminal investigations of the brutal murder series committed by the so called ‚National Socialist Underground‘ (NSU) raise questions about the credibility of Germany’s intelligence services. Are security agencies merely focused on Islamic and leftist extremism but careless when it comes to right-wing terrorism? 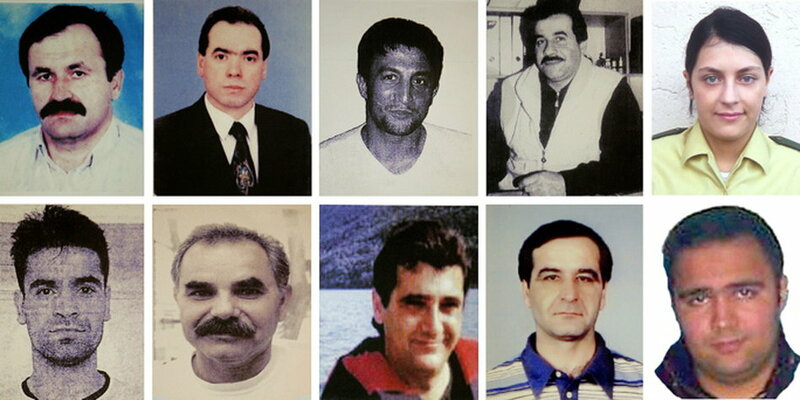 The 10 victims of the NSU: Enver Simsek, Abdurrahim Özüdogru, Süleyman Tasköprü, Habil Kiliç, Michèle Kiesewetter, Mehmet Turgut, Ismail Yasar, Theodoros Boulgarides, Mehmet Kubasik, Halit Yozgat. How could the terrorist trio NSU get away with committing ten murders, and two bombing attacks leaving 22 wounded and at least 14 bank robberies over a period of thirteen years? Why could they not have been stopped before they stopped themselves when there was so much evidence at hand leading to their network of supporters? Staff involved in the criminal investigations into the NSU-case have repeatedly claimed a lack of identifiable competence between local and federal intelligence authorities leading to a breakdown in communication. High-level officials on the other hand implied that there is a systemic lack of loyalty among staff, revealed in glaring personal individual errors. But the sheer number of traces that were overlooked does not allow these failures to be declared as individual mishaps. A couple of days after the NSU had been discovered in November 2011 files highly relevant to the case were shredded in the Federal Office for the Protection of the Constitution. When questioned about the incident by a special investigating committee of the German Parliament, Heinz Fromm, Head of the Domestic Intelligence Agency since 2000, when the murders began, could not provide an explanation. On the 2nd of July 2012, he then announced his early retirement by the end of the year, taking the responsibility for the destruction of the evidence. Only one day later Thomas Sippel was put into early retirement from his office of Intelligence Chief in Thuringia, the State in which the NSU originated. Back in 1998 his agency had found a list with 35 names, addresses and phone numbers of suspected supporters of the NSU. The list was found together with bombs in a garage in Jena during a raid against the right-wing scene but it had been packed away in a cardboard box in the office after the leading chief inspector declared it to be ‘without meaning for the case at hand’. That was shortly before the first murder was committed. A warrant against the previously convicted trio was issued but they escaped and went underground. The contacts on the list, located in parts of the country where the trio would later hide, were never checked. On the 11th of July 2012, the director of domestic intelligence in the State of Saxony, Reinhard Boos, resigned. This region was indeed the place where the Nazi trio was able to hide undiscovered over the years. Phone call transcripts of suspected supporters of the network remained unused in the storage of his agency where they had only recently been discovered. These files were never delivered to the officials in charge. This was not the only case in which potentially highly relevant material was not transmitted to the cooperating agencies. The prevailing debate about institutional reforms of the intelligence authorities that has arisen from the scandal distracts attention from further questions regarding the stated reasons for the negligence in the NSU investigations. The intelligence agency has been efficient and successful in previous cases such as when it prevented an Islamic terrorist attack by the ‘Sauerland Group’ in 2007. Then why did the agency fail so tremendously in the case of the NSU? Why did nobody suspect a right-wing background when the first nine victims all had a migration background? 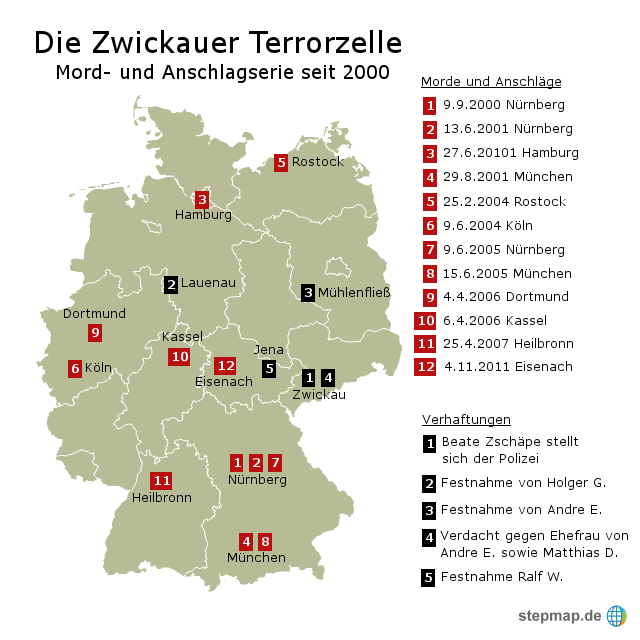 Why did they not suspect a terrorist ideology of a particular group when all victims, randomly located in Germany, were killed with the same weapon? Why had earlier criminal acts by the neo-Nazi trio been played down as youth activism without political motivation? Officials pointed out that information concerning supporters of the trio had to be withheld in order to protect the identity of undercover informers (the ‘so-called V-Mann’) within the right-wing scene. One cannot help but be reminded of the ‘V-Mann’ scandal in 2002 that rendered proceedings to ban the right-wing National Democratic Party (NPD) futile. It was then revealed that more than 130 undercover intelligence agents were infiltrating the extremist party. Their active involvement in criminal actions weakened their credibility as witnesses and rendered it impossible to determine who implemented the ideology and ordered actions. Will a reform satisfy the pain of unanswered questions? There is another crucial hint that raises concerns about the credibility of the state agencies as a whole. Although none of the homicide victims had ever been criminally recorded, investigating authorities repeatedly announced that the searched murderers were suspected to be members of organised crime groups. Given the migratory background of the victims, that seemed to be the obvious conclusion to the German intelligence agencies. One must not overlook the fact that these statements factually also criminalised the victims by assuming their involvement with organised crime groups. Lacking any evidence, these statements were based on mere speculation. The late insight that these assumptions were wrong will hardly make up for the additional pain such false allegations have caused to the bereaved. Kenan Kolat, chairman of the Turkish community in Germany, has accused German authorities of “institutional racism”. Germans react extremely sensitively at the term, associating racism only to extremist ideology and the Fascist past of their country but such an understanding makes the public inattentive to the more complex analysis behind the effects of institutional racism. It is the suspicion that there exist two measures of perception and evaluation in criminal investigations, depending on whether the perpetrators or the victims are ‘non-German’. If such a rationale, be it intended or subconscious, lies behind the negligence of authorities, it proves that structural and bureaucratic racism can be just as fatal as blunt violence. One cannot help but thinking whether these murders could have been prevented.